The first thing that I love about my desk is the flip down top, which means that I can keep a relatively large amount of things hidden when it is closed. There’s a little drawer and lots of other cubby holes for things like notebooks, stamps, receipts that kind of thing. When I finish work for the day I can fold it up and forget all about work! Wen I’m working something that I find is really important to do is to back everything up as I go. I learnt this the hard way around two years ago a laptop just stopped working out of the blue! It was only a few months old so I hadn’t backed anything up on it and I lost quite a lot of work, that couldn’t be recovered. Lesson learnt! Depending on what it is I’m working on I backup in a number of ways; to a cloud drive but I also like to keep hard copy too of really important things like tax records and photos! I use this little portable WD My Passport drive a lot, it’s tiny and USB powered but holds 1TB of data. For things where I need to just transfer things between laptops and that kind of thing I use a USB stick. The latest one in my collection has my blog name on it! It’s engraved into the wooden casing of a 32gb memory stick, how cool is that! 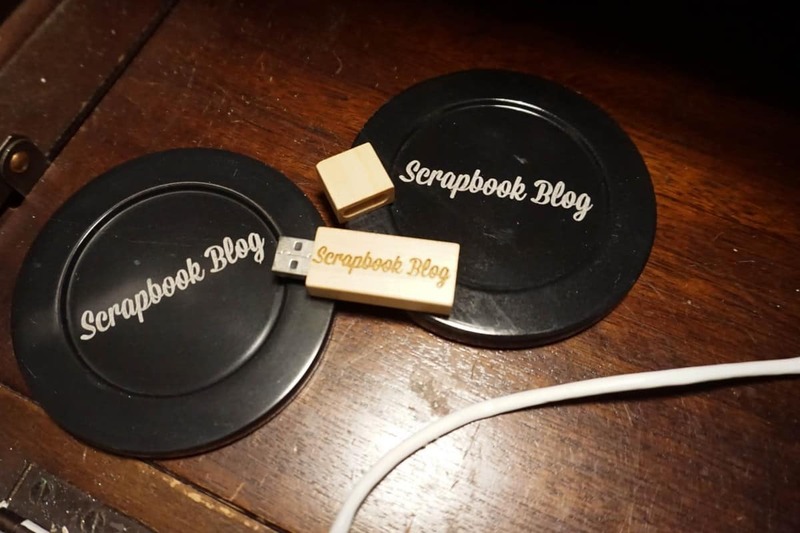 Get Etched also sent me two marble coasters, also with ‘Scrapbook Blog’ on! The coasters are great because the top of my desk is very old leather and I’m trying to avoid marking it more than it already has been. I love the fact that it has lots of old markings on it I think it adds to its character but I’d rather not add any more. 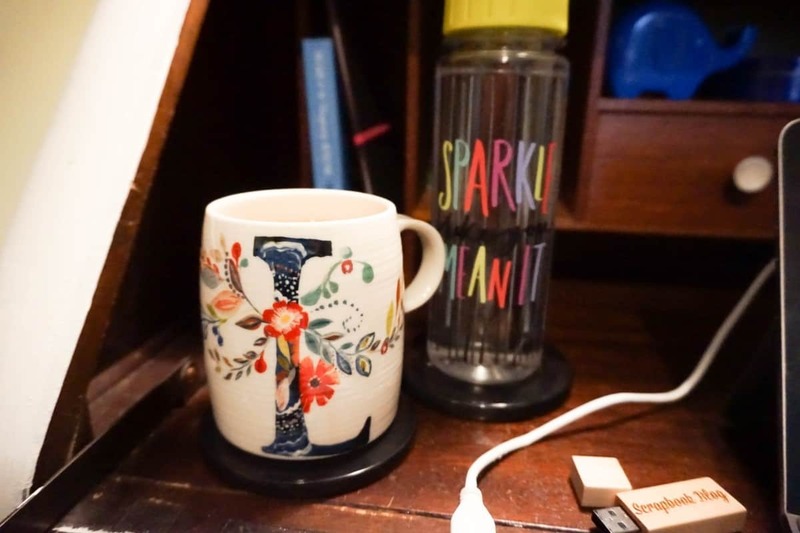 The two marble coasters are perfect for keeping a hot drink and some water close by. You can get phone cases, notebooks and diaries and lots more in the way of personalised gifts on their website; worth a look! My floral monogram mug was from Anthropologie (they have a few different ranges) but this one was reduced in the black friday sale so I snapped it up! The water bottle was a gift from lovely Chelle. Pens are obviously something I need to keep a few of close by! Although I have to do lists on the computer I also keep an overview of dates/deadlines in both my personal and my work life in a family planner. The reason I’m using this now instead of a standard diary is because I found it too hard to keep track of two different diaries/notebooks and I can have everything laid out to view in one page with this planner. 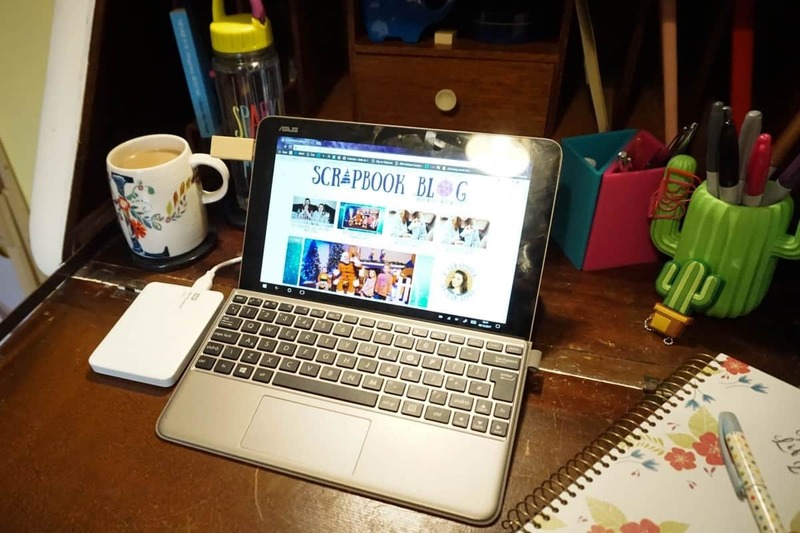 With 8 columns I can easily see what shift Sam is doing, what Athena needs for school, what I am working on and a weekly to do list and meal plan, all on one page! 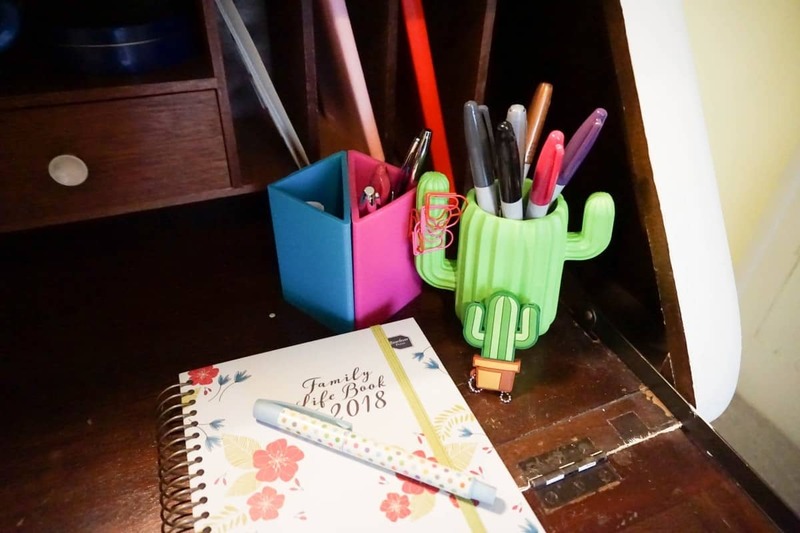 I keep pens handy in a couple of pen holders; the triangular ones are from Wilko a couple of years ago and the funky cactus is a new addition thanks to Mustard. This one has a magnetic arm which means you can keep your paper clips handy plus it’s just a really funky to look at ! 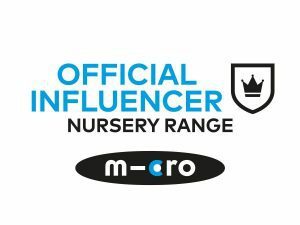 Mustard also sent me a matching earphone splitter which will be ideal for when the kids are using a tablet in the back of the car on long journeys they can have a set of headphones each, then Sam and I won’t have to listen to frozen for the 100th time! Mustard have lots of themed ranges to choose from, with things like unicorns, space & food featuring heavily! My desk is positioned opposite a west facing window which means that in the mornings it’s not that bright, so an angled desk lamp means proper light and a slightly more cosy feeling. 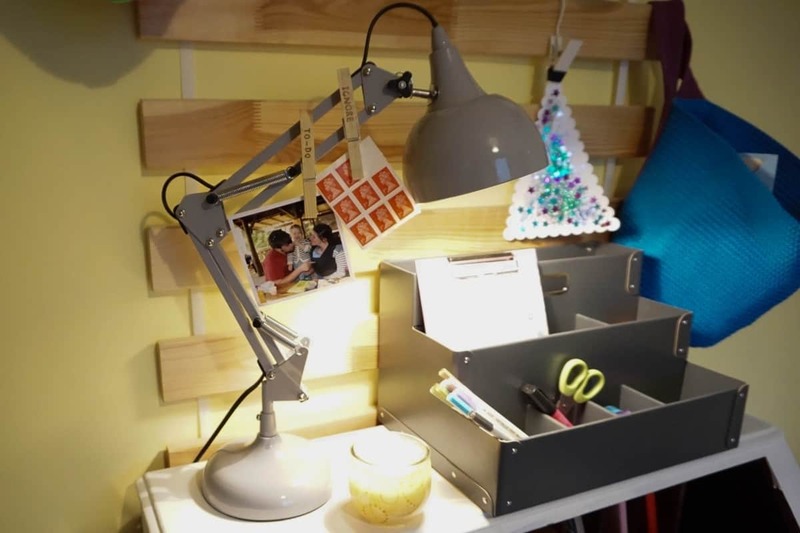 This grey desk lamp from Litecraft means that I can focus the light exactly where I need it, and the other bonus is that being metal I can attach my magnetic peg memo holders to it, which were from Tiger a little while ago. 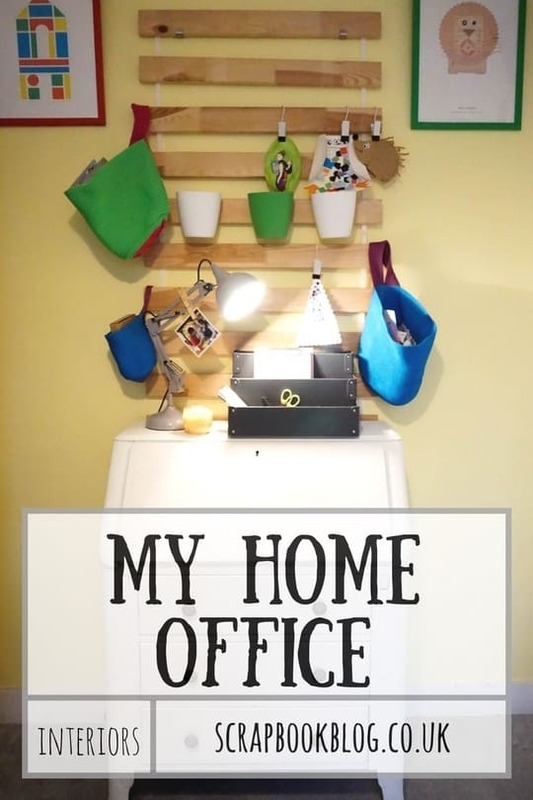 Above the desk is a home-made noticeboard sort of thing, fashioned out of some cot-bed slats, with various storage pots and things, all from Ikea I think! You could easily pin things into the wooden slats, but I can’t bring myself to do so yet! I use hooks to pop up bits of the kids art, and in the pots have things like paint sticks & scissors – things I want to keep away from little hands really! In the colourful cloth bags I have birthday cards and spare sellotape. On top of the desk the grey organiser is another Ikea purchase, it’s made of stiff card but it is pretty sturdy, and my note books, posts and other paper work live in there. I also have an ikea hack for a craft trolley using a Raskog! The laptop in these photos isn’t my main laptop, it’s an Asus transformer; a tablet and laptop in one. It’s great for coffee shops, trains and weekends away, having a touchscreen laptop makes things so much easier, I wish my chunky old 17″ laptop had one! My main laptop does fit on the desk, but you can see a lot less of what’s behind it, hence not photographing it there! 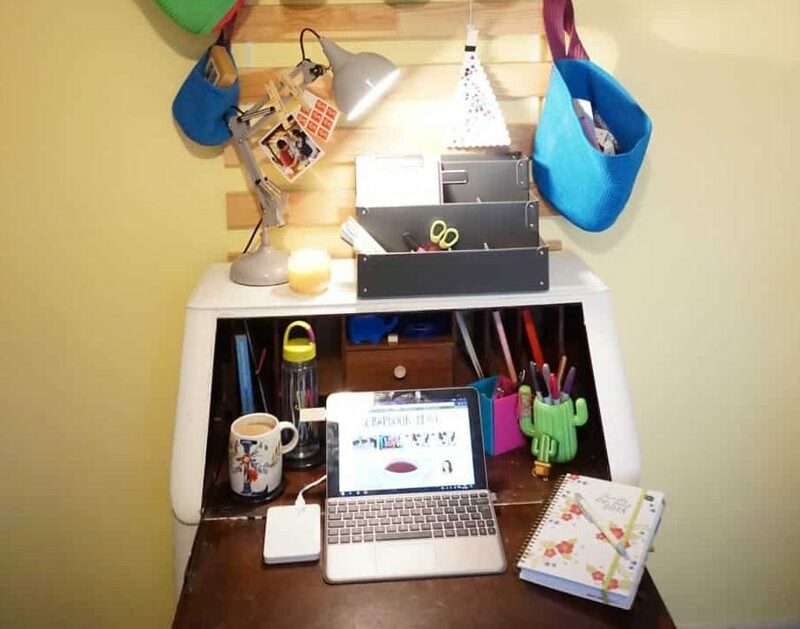 I asked a few other people who work from home what their desk space looks like, so here is Bex’s clean and simple desk , Cat’s yellow themed desk area and Angela’s post on how to organise your desk. This post contains PR samples: the lamp, items from Get etched and Mustard. Everything else was purchased by myself. Post contains affiliate links. Previous Post Sunday Scrapbook – Feeling Festive & Panto! I love it! 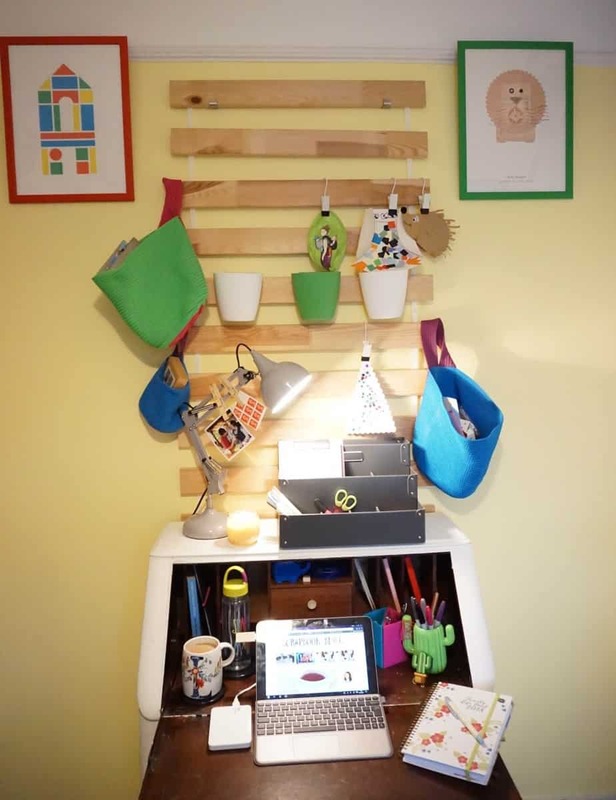 It looks so much better than a big faffy desk and I like that you can stash everything away. Perfect for a horder like me! This looks amazing! My desk is the dumping ground for every one else’s stuff! New year resolution is to sort it and use it! I love seeing everyone else’s work space! My desk is a ridiculous size in comparison, it takes up half of my office, and this makes me wish I’d gone for something more compact!